The slanted tips make it ideal for plucking eyebrows. The pointed tips are particularly suited for the removal of ingrown hairs or splinters. Rubis Ear & Nose Scissors have rounded tips for gentle insertion into the outer area of your nose or ear without fear of injury. Long, pointed tip is perfect for the delicate work of tweezing under the skin for ingrown hairs or removing splinters. Rubis Gold Slant Tweezer The Classic Slant Tip tweezer by Rubis with a beautiful rose gold wash finish. Made in Switzerland. Approximately 3 7/8" length. 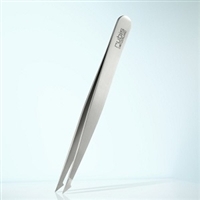 The Rubis Swiss Tweeze Slanted Tweezer is a high-quality cosmetic tweezer that facilitates comfortable, precise use. Use slanted tip for all purpose hair removal, use pointed tip for fine hair and selective tweezing. Allows easy isolation of individual hairs.